This is a photography depicting three austrian woman moments after their suicides in 1945, in fear of the ever-approaching Red Army from the northeast. They had been told through word-of-mouth and possibly also by the authorities that the Soviet Forces raped, pillaged and murdered with contemptuous disrespect anything that got in their way. 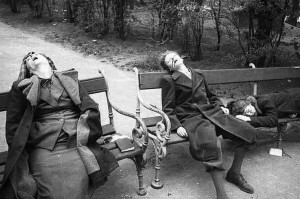 Cases of mass suicides could be observed through-out german-speaking Europe as the war took its last breaths.